Material Primary - Purity: 14K. Product Type: Jewelry. Jewelry Type: Pendants & Charms. Sold By Unit: Each. Material Primary - Color: Yellow. Material Primary - Purity: 14K. Sold By Unit: Each. Material Primary - Color: Yellow. Product Type: Jewelry. Jewelry Type: Pendants & Charms. Material Primary: Gold. Gorgeous 14k yellow gold angel pendant. Real 14k gold.not plated or filled. Great for any thin chain or can be worn as a charm on a bracelet. Solid 10k/14k Jewelry. 925 Silver Jewelry. Ladies Jewelry. 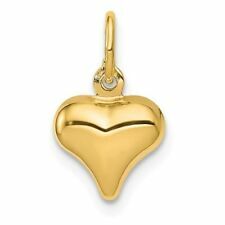 This Small Puffed Heart Charm Pendant is 14K Stamped Yellow Gold, Approximate Item Weight: 0.1 Grams. Chain Is Not Included. To clean gold jewelry, use warm water, a mild soap, and a soft-bristled brush, if needed. We are proud of the joy and happiness we have provided thus far and hope to provide even more. Helpful Links. Wholesale and Manufactures for over 40 years. Buying directly from the source. WHY BUY FROM DSGD?. 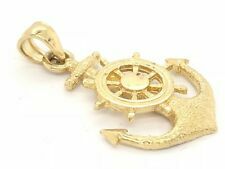 14K yellow Solid Gold pendant charm. Solid 14K gold, not plated. Nicely polished and shiny. Stamped 14K for Authenticity. REAL 14K Yellow Gold. To help guard against stolen credit cards and identity theft, NO exceptions will be made. Material Primary - Purity: 14K. Product Type: Jewelry. Jewelry Type: Pendants & Charms. Sold By Unit: Each. Material Primary: Gold. Material Primary - Color: White. 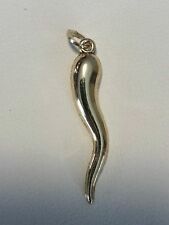 New14K Solid Yellow Gold Musical Note 8th Note Music Charm Pendant. Design - Musical Note. We are proud of the joy and happiness we have provided thus far and hope to provide even more. Helpful Links. Gorgeous 14k yellow & rose gold Our Lady of Guadalupe pendant. Real 14k gold.not plated or filled! Great for any thin chain or can be worn as a charm on a bracelet. Solid 10k/14k Jewelry. 925 Silver Jewelry. This 3-D Key Charm Pendant is 14K Stamped Rose Gold, Approximate Item Weight: 0.48 Grams. Chain Is Not Included. To clean gold jewelry, use warm water, a mild soap, and a soft-bristled brush, if needed. $';document.write(flash_code); 14K Solid Yellow Gold Small Hollow Puffed Double Two Hearts Love Charm Pendant Metal: 14K Solid Yellow Gold Weight: 1.2 Grams approx Stone: No Stones This item will come in beautiful gift box. Absolutely Beautiful and Timeless Piece of Jewelry! Total Gram Weight 1.2 Grams Metal 14K Yellow Gold Style of pendant Heart Charm SUGGESTED RETAIL PRICE: $399.99 TOP QUALITY- GREAT LOW PRICE They are PERFECT to give as a PRESENT! Do you have questions about the product? Send us a message and we will answer all your questions Returns We strive to provide 5 star customer service and want all of our customer's to be 100% satisfied with their purchase. Not happy? Returns are EASY! Send us a message on eBay within 30 days of receiving your item and we will provide you with the return address. Wheat Chains. Snake Chains. Jewelrypot is dedicated towards providing you with the best quality, service, and prices of fine diamond, gemstone, pearl, and silver jewelry. We understand that purchasing jewelry online can be difficult especially since you are unable to feel or try it in person- maybe you thought the item was bigger, or longer, or a different finger size. Raise the fashion bar with this stylish geometric lariat necklace. Created in warm 14K yellow gold, this lariat necklace features two pear shaped charms completed with a 18" inch cable link chain. This necklace comes in a complimentary gift box. Pendent Details Style : Evil Eye Pendant. We are happy to work out the best possible solution with you. Gram weight: . 08. 14K Solid Yellow Gold Hamsa blue Evil Eye Pendant enamel finish Good Luck Charm. Shipped with USPS First Class Package. Bail is stamped 14K. Discover. We are proud of the joy and happiness we have provided thus far and hope to provide even more. Wholesale and Manufactures for over 40 years. Buying directly from the source. WHY BUY FROM DSGD?. Approximate Height - 31.6 mm. You are looking at fabulous and unique solid real 14k Yellow good Aztec calendar pendent. It is stamped 14k on the bail. 100% solid real GOLD. bail size: fits up to 4 mm wide chain. made in U.S.A.
We are proud of the joy and happiness we have provided thus far and hope to provide even more. Approximate Weight - 0.9 grams. Country of Manufacture - United States. Wholesale and Manufactures for over 40 years. New Solid 14K Yellow Gold Diamond Cut Marijuana Leaves Leaf Weed Pendant Charm. Approximate Weight - 1.1 grams. Jewelry Type: Charm/Pendant. add us to your favorites list. 14k Yellow Gold Florida State Map Pendant / Charm. Material 14K Yellow Gold. The Quality is Excellent. They'll make a brilliant gift for yourself or a loved one on any occasion. We are very fair and easy to deal with! Citrine Bracelets. Aquamarine Bracelets. Peridot Bracelets. This pendant has a dragonfly symbol. Pluck this stunning dragonfly pendant now and have the perfect pendant for your necklace. Garnet Bracelets. New Solid 14K Solid Yellow Gold Horse Shoe with Horse Face Charm Pendant. Design - Horse Shoe. (Also available in White & Rose gold Color. Product Features ). 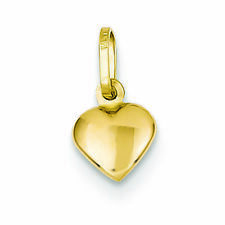 14K Yellow Gold heart Charm Pendant 0.5 Grams Free priority mail Shipping. Condition is Pre-owned very cool hand made look to it the heart is carved ot on spots makea the light bounce off it. This is wearable and or scrap gold. Shipped with FREE USPS Priority Mail Flat Rate Envelope. Jewelry Type: Pendants & Charms. You may also be interested in. Material: 14K Yellow Gold. This cross design was hand carved by a California jeweler. The piece was made and finished by hand using traditional jewelry making techniques. Weight: 4.6 grams (on average). 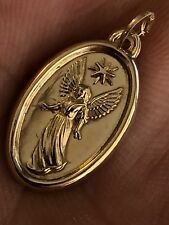 New Solid 14K Yellow Gold Diamond Cut Praying Little Angel Charm Pendant. We are proud of the joy and happiness we have provided thus far and hope to provide even more. Approximate Weight - 1.6 grams. New Solid14K Yellow Gold Diamond Cut Scorpion Insect Charm Pendant. We are proud of the joy and happiness we have provided thus far and hope to provide even more. Country of Manufacture - USA. Free Gift Box. New Solid 14K Rose Gold "I Love you" Charm Pendant. Gift Box included. Approximate Weight - 0.8 grams. FEATURES: Diamond-cut - Die struck - 14k Yellow gold - Textured back. Material Primary - Purity: 14K. Product Type: Jewelry. Jewelry Type: Pendants & Charms. Sold By Unit: Each. Material Primary - Color: Yellow. 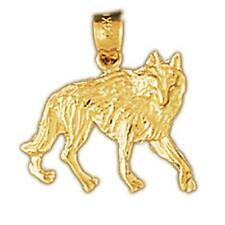 This Initial D Charm Pendant is 14K Stamped Yellow Gold, Approximate Item Weight: 0.28 Grams. In addition, This Item Is A Beautiful Addition To Any Collection. Chain Is Not Included. To clean gold jewelry, use warm water, a mild soap, and a soft-bristled brush, if needed. 14k Yellow Gold Stamped! Girl and Boy Charm Pendant. Girl one is Sapphire & Boy one is Aquamarine. 2.4 Grams! Beautifully crafted in 14 karat real gold, this item is sure to catch the eye of any who can appreciate its beauty. 14K Yellow 2Tone Motion Cross Crucifix Charm Pendant. 14K GOLD, REAL GOLD. Stamped 14K for Authenticity. GOLD Cross Jesus Pendant cruz crucifix charm colgante 14k yellow 2g 2"
14k gold chain 19 inch pre owned, perfect for a pendant or charm.